Henrik Normann heads one of the most successful Nordic institutions, the Nordic Investment Bank. It is celebrating 40 years in business, and was founded with capital from all of the five Nordic countries. “The Nordic countries contributed 278 million euro. In 40 years this has grown into 3.1 billion euro. During that time we have paid dividends of 800 million euro to the countries,” says Henrik Normann in that special Scandinavian version of Danish which Danes use to be sure they are understood – which includes some English expressions when it is particularly important not to be misunderstood. Since 2005 the three Baltic states have also been full members and owners of the bank. Its headquarters lie in Helsinki, with 190 employees. The dividends from NIB alone would be enough to finance the Nordic Council of Minister for more than six years. The Nordic Investment Bank’s task is to lend money to projects which either improve competitiveness or to green investments. Defining a green investment sounds easier than defining what improves competitiveness – how do you actually decide that? “To give it a short answer: Competitiveness is what creates welfare. Together with economists like Christian Ketels at the Harvard Business School we have developed a tool to measure how a project can be defined by looking at four factors: Technology, human capital, infrastructure and market impact. “In order to improve technology we might provide loans to research and development projects, when it comes to human capital we sometimes support education. Competitiveness also depends on good infrastructure – so we’re talking electricity grids, roads and so on. Market impact is about solving tasks cheaper than the competition. “We grade projects by looking at all these factors, from excellent to below average. If we look at what we have invested in, 50 percent of the loans have been linked to greener development, 40 percent have been linked to competitiveness while the remaining 10 percent have been projects which for instance improve the cooperation between the Nordics and the Baltics. The Nordic Investment Bank does not often make the news. But when it does, it is often about some member country’s politicians wanting to turn the bank into something else – like a green only investment bank or making NIB lend money to small businesses and entrepreneurs. “First of all, it is always positive when people show an interest in the bank. Secondly, we are already a green bank in many ways. No matter what people might think we should be doing, it is my personal opinion that there must be a certain size to make things effective. I would become worried if you established a green Swedish bank, a green Norwegian bank and a green Danish bank, for instance. “It is better to use a common bank in that case, since the process of considering a loan is the same. By being bigger you also secure diversification of the projects, which makes things less risky. So what is the advantage of getting a loan from NIB, compared to other providers? Can green projects get a lower interest rate if they come to you? Not many banks have a triple A rating like the Nordic Investment Bank – the highest credit rating a bank can get. NIB is punching above its weight, the ratings agency Moody writes, using one of President Obama’s favourite expressions to describe why the bank has retained its high rating during its 40 years in the market. “Of course we have lost money on some projects, like in Iceland in 2008. That year the bank also ran with a loss. But during the financial crisis we always had access to the international capital markets,” points out Henrik Normann. That meant the bank could keep issuing bonds, which is a way of bridging the gap which always has been the great challenge for the financial markets – the fact that those who want to lend money often operate with a shorter horizon than those who want to borrow. The biggest players in the bond markets are states and building societies. The finance crisis was born when the building societies packaged different mortgages in a way which made it impossible of those buying bonds to see what level of risk they were taking. When house prices fell in the USA, this meant that those who wanted to lend money fled to the few institutions which were deemed to be safe, including NIB. “We used that trust when we saw gaps emerging which meant that Nordic projects did not get necessary finance. A bank with no losses is not doing its job. “You can never stop a tsunami like the finance crisis, but we can operate a bit against the market current,” says Henrik Normann. Has NIB also helped secure higher employment rates in the Nordics and Baltics? What is the difference between working for Danske Bank, where you worked before as Managing Director of Danske Markets, and working for NIB? Contributing to the development of green technology is one such goal. Henrik Norman points out that it is not only the Baltic states which can benefit from NIB’s extremely positive rating. All in all, NIB’s balance sheet total is 28 billion euro. 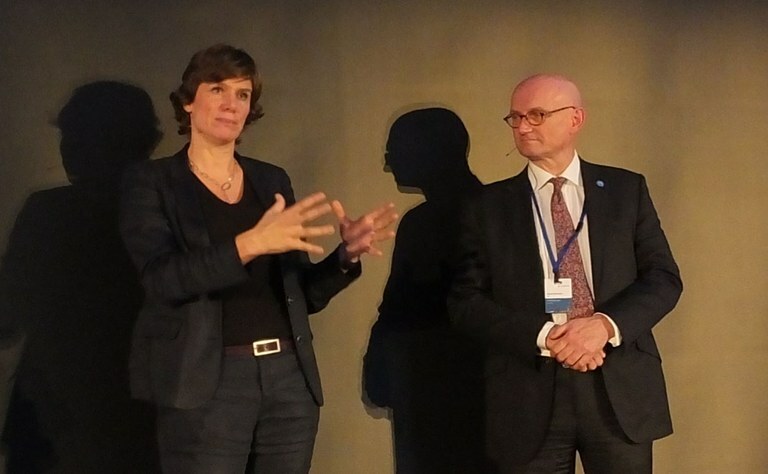 The main speaker at NIB’s anniversary event during the Nordic Council’s Copenhagen meeting was Mariana Mazzucato, who is professor in the economics of innovation at the University of Sussex in the UK. She argues the state should be playing a greater roll in industrial development. In a range of studies of different trades, like pharmaceuticals, biotechnology and IT, she has shown how great a role basic public research plays. In one study of how the iPhone was developed, she shows how all of the most important technologies which make the mobile telephones smart have been financed with public money – like the internet, GPS, touch screens and voice recognition software like Siri. Is it the role of the state or NIB to choose between different green technologies, for instance wave power or wind power, and thus influence development? Will the Nordic Investment Bank be here in 40 years from now? “I believe all companies should ask themselves every five years: Are we relevant? I think NIB will be in five years from now. The financial sector will prevail, in any case. We are among the oldest trades in the world, we’re mentioned in the Bible,” says Henrik Normann, who likes to make jokes about bank directors and how they are far from people’s favourite group of professionals. I’m reading two books right now. One by Swedish author and historian Johan Norberg, ‘Progress – Ten reasons to Look Forward to the Future”. I recommend it to all pessimists. Norberg points to how much progress has been achieved in so many areas. The other book is about the second world war. It is Hans Kirchhoff’s biography ‘The good German’ which is about the German diplomat Georg Ferdinand Duckwitz. He was the one who in 1943 warned that Danish Jews were to be deported to German concentration camps. It meant most of them managed to flee to Sweden. A very exciting book. When I left Danske Bank I was given a Japanese knife which is very sharp, and the handle is very beautifully crafted. I use it to cut meat. There were so many different things, but I toyed with the idea of becoming a farmer. But then I saw Perry Mason in the TV series Ironside, and I wanted to become a defence lawyer instead. I don’t have many talents, so I try to use the ones I have to the max.